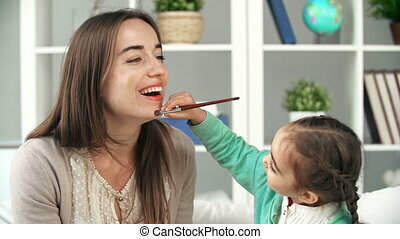 Beautycare. 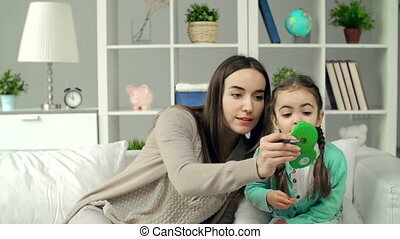 Close up of mother playing with her daughter salon game. 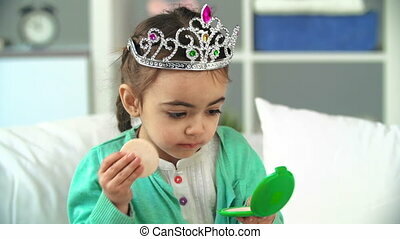 Sponges and applicators for decorative cosmetics fall to the surface. 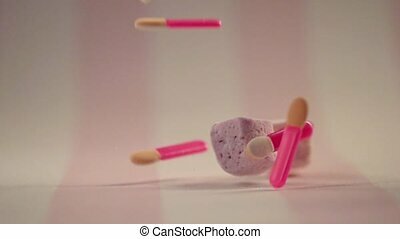 Pink applicators and sponges fall in slow motion. Close-up. The foreground is blurred. The background in stripes is pink-white. 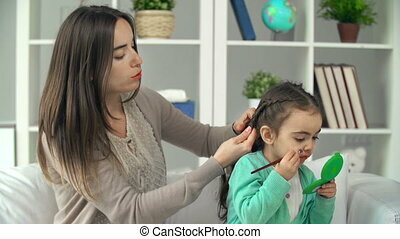 The streams of blue nail polish are poured onto the sponges and flow down its surface. Blue paint drips onto a pink sponge in the shape of a heart. Drops of paint flow down the surface of the makeup sponge. Close-up. Slow motion. A lot of shiny particles pour in front of the camera. The frame is displayed in the mirror of the powder. The foreground is blurred. Glittering particles pour down from top to objects in a scene. Close-up. Slow motion. 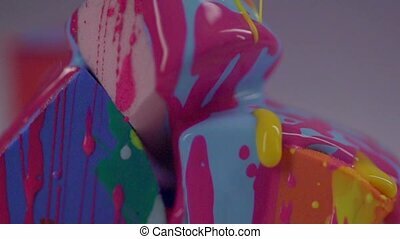 Colorful nail polish flows down the surface of the make-up sponge. 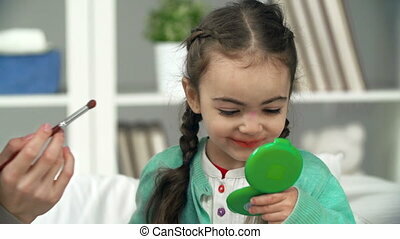 Jets of multi-colored nail polish drip onto the make-up sponge. 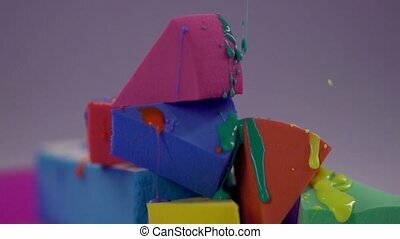 The paint drips onto the sponge and drains over them. Close-up. Slow motion. The streams of pink varnish fall down on a pile of makeup sponges. Jets of thick nail polish flow down the surface of the make-up sponge. Close-up. Slow motion. Pink applicators and sponges fall in slow motion. Close-up. The foreground is blurred. The background in stripes is pink-white. Shiny particles fall on cosmetics in the frame. The frame is displayed in the mirror of the powder. The foreground is blurred. Glittering particles pour down from top to objects in a scene. Close-up. Slow motion. Blue paint drips onto a pink sponge in the shape of a heart. Drops of paint flow down the surface of the makeup sponge. Close-up. Slow motion. 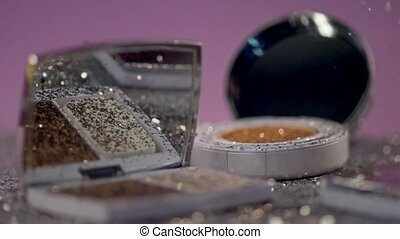 Compact powders with a mirror stand on the surface among the shiny particles. Glittering particles pour down from top to objects in a scene. Close-up. Slow motion. Jets of thick nail polish flow down the surface of the make-up sponge. 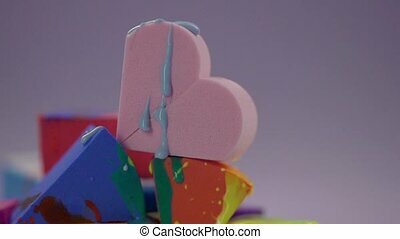 Blue paint drips onto a pink sponge in the shape of a heart. Drops of paint flow down the surface of the makeup sponge. Close-up. Slow motion. A close-up of the yellow nail polish flows down the lacquer on the sponge. Nail polish drains over a bunch of make-up sponges. Jets of thick nail polish flow down the surface of the make-up sponge. Slow motion. Jets of yellow nail polish fall on sponge. Jets of multi-colored nail polish drip onto the make-up sponge. The paint drips onto the sponge and drains over them. Close-up. Slow motion. 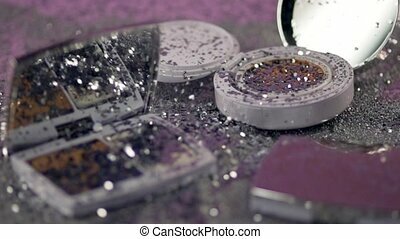 Sequins fall on cosmetics. The foreground is blurred. Glittering particles pour down from top to objects in a scene. 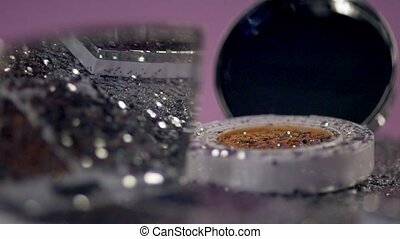 Compact powders with a mirror stand on the surface among the shiny particles. Close-up. Slow motion. 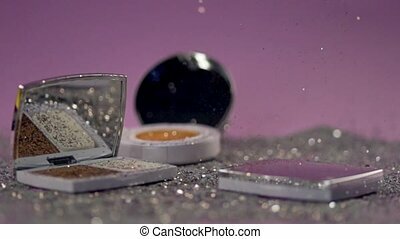 Shiny particles fly over makeup. Brilliant particles lie on the powder and the kushon. Glittering particles pour down from top to objects in a scene. Close-up. Slow motion. 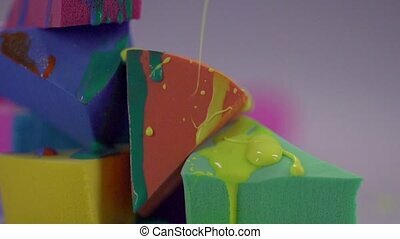 A multicolored paint drips onto the pyramid from the sponge for make-up. Sponges of different colors are composed of a pyramid on a gray-lilac background. Close-up. Slow motion.